Investing in the student experience has always been important, but there has been a recent shift in what that means. Traditionally, investing in the student experience meant spending on—to a certain extent—frivolities and luxuries. And for some, lazy rivers, state of the art athletics centers, and gourmet dining halls may still pay off. But for the majority of postsecondary institutions these only scratch the surface of what students expect from their experience. Students today are pressed for time and have extremely high expectations when it comes to the level of service they expect to receive. That doesn’t mean they’re looking to purchase a degree, nor does it mean they want butlers in their dorms. As experienced online shoppers, they just want a digital experience that matches what they see from online retailers, banks, and pretty much every other organization in the services industry. You might not think IT plays a key role in creating the level of service students crave, but you’d be wrong. Students notice the quality of your institution’s back end more than you might realize… and it colors their experience more than you might expect. So how can you change your students’ minds? Simply put, IT should minimize the amount of time students have to spend dealing with bureaucratic red tape and allow them to do what they enrolled for: studying and learning. In short, this means your administrative systems and processes should be built around the needs and expectations of students, rather than around the limitations of your existing technologies and workflows. Most colleges and universities are still relying on traditional administrative systems that were designed for 18- 22-year-old students, fresh out of high school with minimal expectations. Unfortunately for most colleges and universities, these students don’t really exist anymore. Achieving student-centricity—true student-centricity—for a modern institution requires leaders to take a good long look at a new class of technology in this space: Customer Lifecycle Management (CLM). A CLM is, in essence, a supercharged SIS. It’s designed to handle everything a traditional administrative system would manage, but it puts the learners’ experience first and designs all processes around it. Basically, a CLM system allows colleges and universities to deliver the customer experience provided by top brands, without breaking the bank or resorting to superhuman staff effort. By leveraging the possibilities made available by CLM systems, higher education institutions can close the gap with companies like Amazon and create an engaging and personalized experience that will help them attract, retain and re-enroll students over the course of their careers. 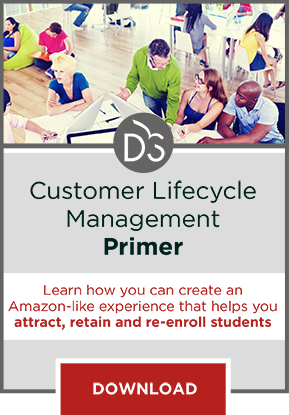 Learn how a Customer Lifecycle Management System can transform your student experience by downloading this primer.